My Mom, gotta love her, is the ultimate shopper. The only one I know of that comes close is my Aunt. Go figure. Too bad they aren't very close, they could have loads of fun together. 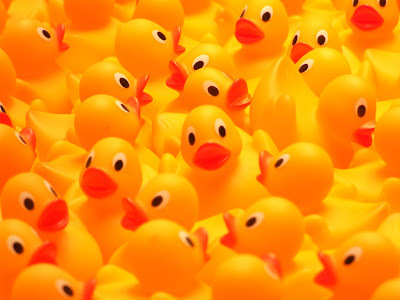 The theme is rubber duckies. She is carrying around a huge list (my mom is a total list person. She has lists on everything including napkins in her purse). 7Th stop, Thrift Store (we ended up having to squeeze a night stand into my car, TG the seats fold down. I was so exhausted by the time we got back. My feet still haven't recovered lol. I'm such a wuss when it comes to shopping. Sounds like your Mum and I would get on... we both love to shop! I'm not a big shopper but I do like to shop cheap!! I tend to buy more stuff if it's cheap. Sounds like a tiring day, though. My daughter (now 20) always wanted to do her bathroom in a yellow duckies theme. We never got around to it.... Cute stuff though. I learned something here today. Did not know JW did baby showers, since they do not do birthdays and other holidays. I thought Jehovah's Witness hated anything fun or festive....I am going to start my own religion....and call it 'Jehovah Didnt See Squat' or JDSS for short. Book & Book Mark Winner for July! Perks of Working: EYE Candy! Book Club for July-WIN IT! Hope you had a fab Fourth!